We routinely excite Positronium (Ps) into its first excited state (n = 2) via 1-photon resonant excitation [NJP. 17 043059], and even though most of the time this is an intermediate step for subsequent excitation to Rydberg (high n) states [PRL. 114, 173001], there is plenty of interesting physics to be explored in n = 2 alone, as we discussed in one of our recent studies [PRL. 115, 183401 and PRA. 93, 012506]. 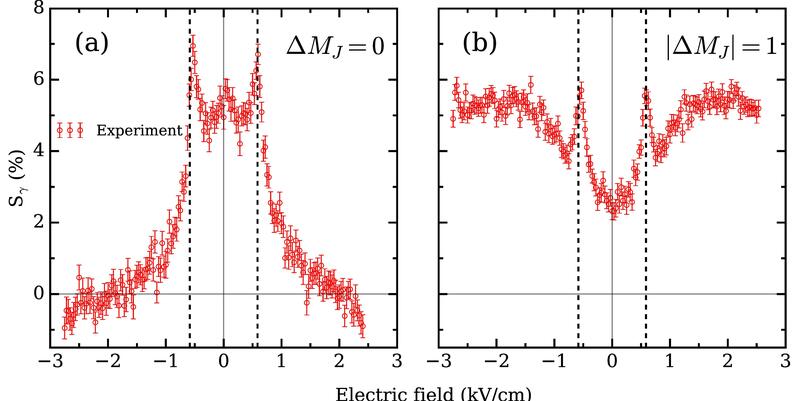 In this study we showed that the polarisation of the excitation laser, as well as the electric field that the atoms are subjected to, have a drastic effect on the effective lifetime of the excited states and when Ps annihilates. Above you can see the data for two laser polarisations, showing the Signal parameter S(%) as a function of electric field, this is essentially a measure of how likely Ps is to annihilate compared to ground-state (n = 1) Ps, that is to say, if S(%) is positive then n = 2 Ps in such configuration annihilates with shorter lifetimes than n = 1 Ps (142 ns), whereas if S(%) is negative then n = 2 Ps will annihilate with longer lifetimes than 142 ns, These longer lifetimes are present in the parallel polarisation (pannel a). Using this polarisation, and applying a large negative or positive electric field (around 3 kV/cm), provides such long lifetimes due to the excited state containing a significant amount of triplet S character (2S), a substate of n = 2 with spin = 1 and = 0. If the Ps atoms are then allowed to travel (adiabatically) to a region of zero nominal electric field (our experimental set-up [RSI. 86, 103101] guarantees such transport), then they will be made up almost entirely of this long-lived triplet S character, and will thus annihilate at much later times than the background n = 1 atoms. These delayed annihilations can be easily detected by simply looking at the gamma-ray spectrum recorded by our LYSO detectors [NIMA. 828, 163] when the laser is on resonance (“Signal”), and subtracting it from the spectrum when the laser is off resonance (“Background”). The figure above shows such spectra taken with the parallel laser polarisation, at a field where there should be minimal 2S Production (a), and a field where triplet S character is maximised (b). It is obvious that on the second case, there are far more annihilations at later times, indicated by the positive values of the data on times up to 800 ns. This is clear evidence that we have efficiently produced n = 2 triplet S states of Ps using single-photon excitation. Previous studies of 2S Ps produced such states either by collisional methods [PRL. 34, 1541], which is much more inefficient than single-photon excitation, or by two-photon excitation, which is also more inefficient, requires much more laser power and is limited by photo-ionisation [PRL. 52, 1689]. This observation is the initial step before we begin a new set of experiments where we will attempt to measure the n = 2 hyperfine structure of Ps using microwaves! Positronium (Ps) is a hybrid of matter and antimatter. Made of just two particles – an electron and a positron – the atomic structure of Ps is similar to hydrogen. The ultimate aim of our experiments at UCL is to observe deflection of a Ps beam due to gravity, as nobody knows if antimatter falls up or down. 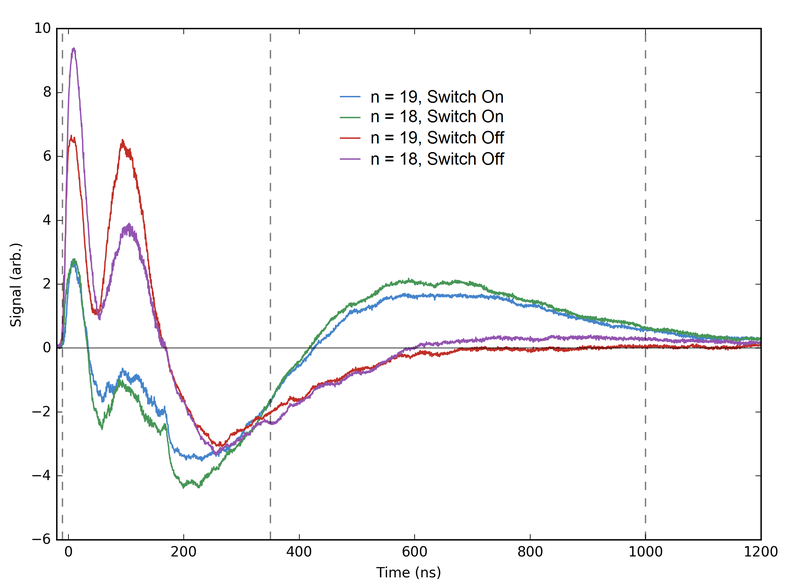 In this post, we outline how we recently managed to guide positronium using a quadrupole. Because the Ps atom doesn’t have a heavy nucleus, it’s extremely light and will typically move very, very quickly (~100 km/s). A refinement of the guiding techniques we used can, in principle, be applied to decelerate Ps atoms to speeds that are more suitable for studying gravity. Before guiding positronium we have to create some. Positrons emitted from a radioisotope of sodium are trapped in a combination of electric and magnetic fields. They are ejected from the trap and implanted into a thin-film of mesoporous silica, where they bind to electrons to form Ps atoms; the network of tiny pores provides a way for these to get out and into vacuum. The entire Ps distribution is emitted from the film in a time-window of just a few billionths of a second. This is well matched to our pulsed lasers, which we use to optically excite the atoms to Rydberg levels (high principal quantum number, n). If we didn’t excite the Ps then the electron-positron pairs would annihilate into gamma-ray photons in much less than a millionth of a second, and each would be unlikely to travel more than a few cm. However, in the excited states self-annihilation is almost completely suppressed and they can, therefore, travel much further. 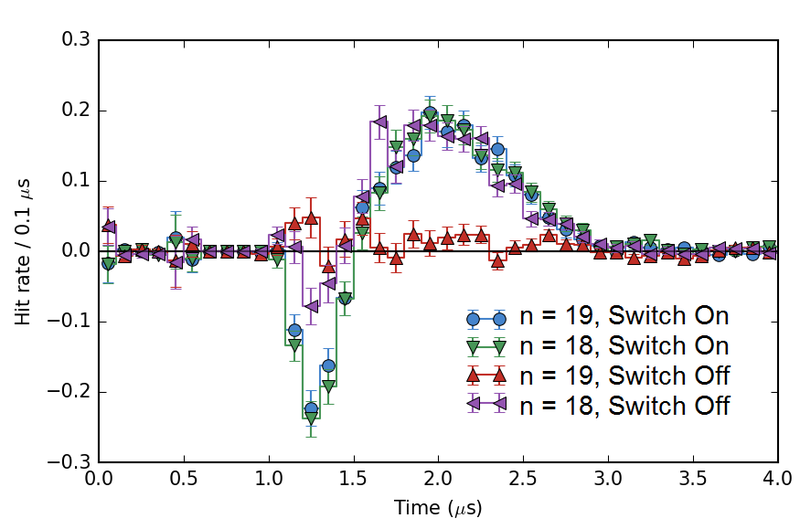 Stark broadening of n=12 Ps in an electric field. The Stark effect provides a way to manipulate the motion of neutral atoms using electric fields. As an atom moves between regions of different electric field strength its internal energy will shift according to its electric dipole moment. However, because the total energy must be conserved the kinetic energy will also change. Depending on whether the atom experiences a positive or negative Stark shift, increasing fields will either slow it down or speed it up. The Rydberg-Stark states can ,therefore, be broadly grouped as either low-field-seeking (LFS) or high-field-seeking (HFS). The force exerted by the electric field is much smaller than would be experienced by a charged particle. Nevertheless, this effect has been demonstrated as a useful tool for deflecting, guiding, decelerating, and trapping Rydberg atoms and polar molecules. Rydberg positronium source, lasers, gamma-ray detectors, and quadrupole guide. A quadrupole is a device made from a square array of parallel rods. Positive voltage is applied to one diagonal pair and negative to the other. This creates an electric field that is zero along the centre but which is very large directly between neighbouring rods. The effect this has on atoms in LFS states is that when they drift away from the middle into the high fields they slow down, and eventually turn around and head back towards the centre, i.e., they are guided. On the other hand, atoms in HFS states are steered away from the low-field region and out to the side of the quadrupole. Electric field strength and trajectory calculation for low-field-seeking (blue), high-field-seeking (red), and unaffected (green) Rydberg-Stark states of positronium in a quadrupole guide. Using gamma-ray detectors at either end of a 40 cm long quadrupole we measured how many Rydberg Ps atoms entered and how many were transported through it. With the guide switched off some atoms from all states were transmitted. However, with the voltages switched on there was a five-fold increase in the number of low-field-seeking atoms getting through, whereas the high-field-seeking atoms could no longer pass at all. The number of Rydberg Ps atoms entering (red) and passing all the way through (blue) the quadrupole guide. A large part of why we chose to use positronium for our gravity studies is that it’s electrically neutral. As the electromagnetic force is so much stronger than gravity we, therefore, avoid otherwise overwhelming effects from stray electric fields. However, by exciting Ps to Rydberg-Stark states with large electric dipole moments we reintroduce the same problem. Nonetheless, it should be possible to exploit the LFS states to decelerate the atoms to low speeds, and then we can use microwaves to drive them to states with zero dipole moment. This will give us a cold Rydberg Ps distribution that is insensitive to electric fields and which can be used for gravitational deflection measurements. Our article “Electrostatically guided Rydberg positronium” has been published in Physical Review Letters. 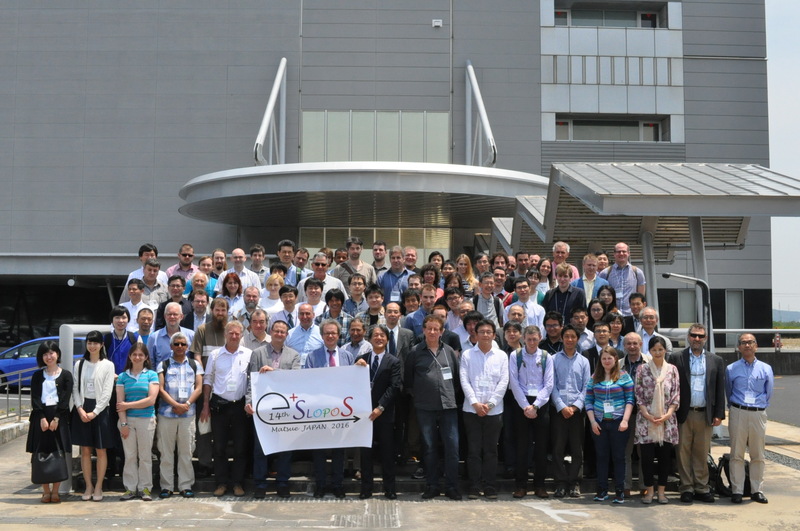 Members of the UCL positronium laser spectroscopy group recently attended the 14th International Workshop on Slow Positron Beam Techniques & Applications (SLOPOS14) in Matsue, Japan. The conference took place from the 22nd to the 27th of May 2016. During this time we heard many great talks from groups working with positrons and positronium (Ps) from all over the world. Positronium with Electric Fields”, given by Alberto. M. Alonso (PhD student), was awarded a prize for making an outstanding contribution to the conference! SLOPOS14 was a great opportunity to meet fellow physicists working in our field, to learn of their progress and to share our own. These meetings are important for discussing new results and new ideas, and for building collaborations for future work. We are extremely grateful to the organisers for their hard work in hosting the event. Doing experiments with antimatter presents a number of challenges. Not least of these is that when a particle meets its antiparticle the two will quickly annihilate. As far as we know we live in a universe that is dominated by matter. We are certainly made of matter and we run experiments in matter-based labs. How then can we confine positrons (anti-electrons) when they disappear on contact with any of our equipment? where c is the speed of light (299792458 m/s). For this reason antimatter has long fascinated science fiction writers: there is a potentially vast amount of energy available – e.g., for propelling spaceships or destroying the Vatican – when only a small amount of antimatter annihilates with matter. However, the difficulty in accumulating even minuscule amounts means that applications in weaponry and propulsion are a very long way from viable. When an electron and positron annihilate the energy takes the form of gamma-ray photons. Usually two, each with 511 keV of energy. Although annihilation raises some difficulties, the distinct signature it produces can be very useful for detection purposes. Gamma rays are hundreds of thousands of times more energetic than visible photons. To detect them we use scintillation materials that absorb the gamma ray energy and then emit visible light. Photo-multiplier tubes are then used to convert the visible photons into an electric current, which can then be recorded with an oscilloscope. Many materials are known to scintillate when exposed to gamma rays, although their characteristics differ widely. The properties that are most relevant to our work are the density (which must be high to absorb the gamma rays), the length of time that a scintillation signal takes to decay (this can vary from a few ns to a few μs), and the number of visible photons emitted, i.e., the light output. Sodium iodide (NaI) is a popular choice for antimatter research because the light output is very high, therefore individual annihilation events can easily be detected. However, for some applications the decay time is too long (~1 μs). The material we normally use to perform single-shot positron annihilation lifetime spectroscopy (SSPALS) is lead tungstate (PbWO4) – the same type of crystal is used in the CMS electromagnetic calorimeter. This material has a fast decay time of around 10 ns, which allows us to resolve the 142 ns lifetime of ground-state positronium (Ps). However, the amount of visible light emitted from PbWO4 is relatively low (~ 1% of NaI). Recently we began experimenting with using Lutetium-yttrium oxyorthosilicate (LYSO) for SSPALS measurements, even though its decay time of ~40 ns is considerably slower than that of PbWO4. So, why LYSO? The main reason is that it has a much higher light output (~ 75% of NaI), therefore we can more efficiently detect the gamma rays in a given lifetime spectrum, and this significantly improves the overall statistics of our analysis. The compromise with using LYSO is that the longer decay time distorts the lifetime spectra and reduces our ability to resolve fast components. However, most of our experiments involve using lasers to alter the lifetime of Ps (reducing it via magnetic quenching or photoionisation; or extending it by exciting the atoms to Rydberg levels), and we generally care more about seeing how much the 142 ns component changes than about what happens on shorter timescales. The decay time of LYSO is just about fast enough for this, and the improvement in contrast between signal and background measurements – which comes with the improved statistics – outweighs the loss in timing resolution. Single-shot positron annihilation lifetime spectroscopy with LYSO scintillators, A. M. Alonso, B. S. Cooper, A. Deller, and D. B. Cassidy, Nucl. Instrum. Methods : A 828, 163 (2016) DOI:10.1016/j.nima.2016.05.049. How long does Rydberg positronium live? Time-of-flight (TOF) is a simple but powerful technique that consists of accurately measuring the time it takes a particle/ atom/ ion/ molecule/ neutrino/ etc. to travel a known distance. This valuable tool has been used to characterise the kinetic energy distributions of an exhaustive range of sources, including positronium (Ps) [e.g. Howell et al, 1987], and is exploited widely in ion mass spectrometry. Last year we published an article in which we described TOF measurements of ground-state (n=1) Ps atoms that were produced by implanting a short (5 ns) pulse of positrons into a porous silica film. 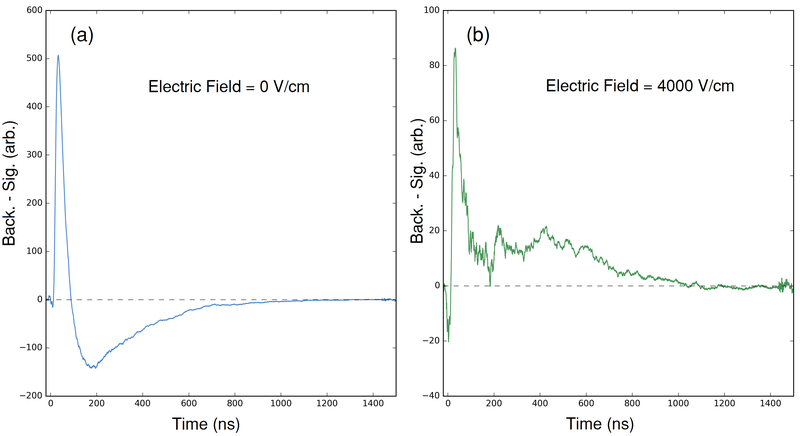 Using pulsed lasers to photoionise (tear apart) the atoms at a range of well-defined positions, we were able to estimate the Ps velocity distribution, finding mean speeds on the order of 100 km/s. Extrapolating the measured flight paths back to the film’s surface indicated that the Ps took on average between 1 and 10 ns to escape the pores, depending on the depth to which the positrons were initially implanted. When in the ground state and isolated in vacuum the electron and positron that make up a positronium atom will tend to annihilate each another in around 140 ns. Even with a speed of 100 km/s this means that Ps is unlikely to travel further than a couple of cm during its brief existence. Consequently, the photoionisation/ TOF measurements mentioned above were made within 6 mm of the silica film. However, instead of ionising the atoms, our lasers can be reconfigured to excite Ps to high-n Rydberg levels, and these typically live for a great deal longer. The increase in lifetime allows us to measure TOF spectra over much longer timescales (~10 µs) and distances (1.2 m). The image above depicts the layout of our TOF apparatus. Positrons from a Surko trap are guided by magnets to the silica film, wherein they bind to electrons and are remitted as Ps. Immediately after, ultraviolet and infra-red pulsed lasers drive the atoms to n=2 and then to Rydberg states. Unlike the positively charged positrons, the neutral Ps atoms are not deflected by the curved magnetic fields and are able to travel straight along the 1.2 m flight tube, eventually crashing into the end of the vacuum chamber. The annihilation gamma rays are there detected using an NaI scintillator and photomultipler tube (PMT), and the time delay between Ps production and gamma ray detection is digitally recorded. The plots above show two different views of time-of-flight spectra accumulated with the infra-red laser tuned to address Rydberg levels in the range of n=10 to 20. The data shows that more Ps are detected at later times for the higher-n states than for lower-n states. This is easily explained by fluorescence, i.e., the decay of an excited-state atom via spontaneous emission of a photon. As the fluorescence lifetime increases with n, the lower-n states are more likely to decay to the ground state and then annihilate before reaching the end of the chamber, reducing the number of gamma rays seen by the NaI detector at later times. We estimate from this data that Ps atoms in n=10 fluoresce in about 3 µs, compared to roughly 30 µs for n=20. This work brings us an important step closer to performing a positronium free-fall measurement. A flight path of at least ten meters will probably be required to observe gravitational deflection, so we still have some way to go. Measurement of Rydberg positronium fluorescence lifetimes. A. Deller, A. M. Alonso, B. S. Cooper, S. D. Hogan, and D. B. Cassidy. Phys. Rev. A 93, 062513 (2016)DOI:10.1103/PhysRevA.93.062513.